Very little can so far be said about the function of the architecture, which belongs to three or four phases because of the limited exposed area. Most of it is well-preserved despite the fact that it is built of sun-dried mudbrick without stone foundations. 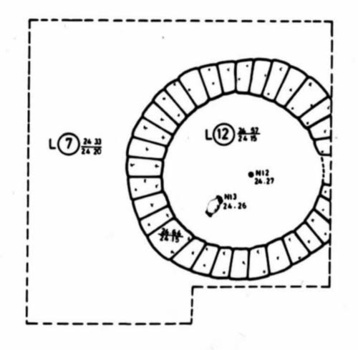 The interpretation of a circular construction of H3 in Trench 1 must await the exposure of a larger area. Fig. 5. Trench 1, H3: circular construction with conaines the scattered bones of an equid. The number of complete or almost complete objects four of which are vessels of earthenware is astonishing considering the small excavated area. Fig. 6. Three Late Bronze Age vessels; centre: Egyptian import. The repertoire of pottery and small finds demonstrates the cosmopolitan nature of the obviously rich societies of Tell el-‘Ajjul. The majority of the imported pottery comes from Cyprus but it derives also from Egypt, Greece and the Jordan Valley, and maybe also from the northern Levant. The Cypriote-imported wares include Red-on-Black, White Slip I (mainly bichrome – decorated; Fig. 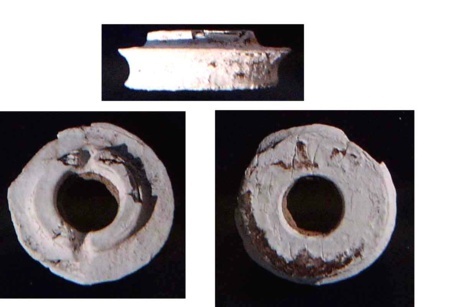 7) and II, Base-ring I and II (Fig. 8), Red Lustrous Wheel-made and also vessels of the Bichrome Wheel-made Ware (Figs. 9, 10). The Jordan Valley and southern Lebanon are the likely sources of the Chocolate-on-White Wares. The alabaster vessels and a faience/glass object of unknown function (Fig. 11) very probably belong to the group of objects which were imported from Egypt. An Egyptian import of earthenware is an elongated vertical ovoid jug with a slightly pointed base and three incised lines just below the neck (Fig. 12). It is a product of the early 18th Dynasty. The two scarabs may also have been imported from Egypt, or they were locally produced. The raw material for the production of jewellery was certainly an import from different regions of the Eastern Mediterranean and Egypt/Sudan (see e.g. jewellery in Fig. 13). A cautious approach to the chronology of H1-H4 is based on certain ceramic wares alone. The lowest dates of the excavated occupational layers, i.e. H1+2, may be defined by a late White Slip II bowl. Late White Slip has been found at the nearby site of Deir el-Balah, which lies approximately 10 km southwest of Tell el-‘Ajjul. This ware is dated to the 13th century at Deir el-Balah, i.e. approx. the reigns of Sethos I and Ramses II. The Mycenaean piriform jar (Fig. 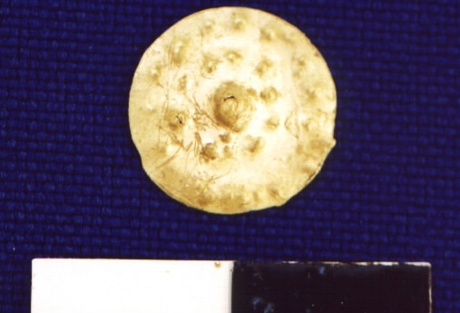 14) from the same phase can be dated to Late Helladic IIIB1 from its shape (FS48) and the decorative elements (FM57). The lowest date possible would then be the first half of the 13th century. Fig. 14. Small Mycenean IIIB1 piriform jar. The dates of the lowest layer of Trench 1 so far to contain diagnostic pottery, H4, may be provided by Cypriote Red-on-Black which was found together with White Slip I and Eggshell Ware. Another locus from H4 produced White Slip I, Black Lustrous and unburnished bichrome-decorated ware. The latest ascertained appearance of Red-on-Black Ware is Late Cypriote IA2 which is the period of the earliest appearance of White Slip I (according to Åström 1972: 700). Our find context is in full agreement with Åström’s table. Åström dates Late Cypriote IA2 between 1550/1540 – 1525/1500 B.C. 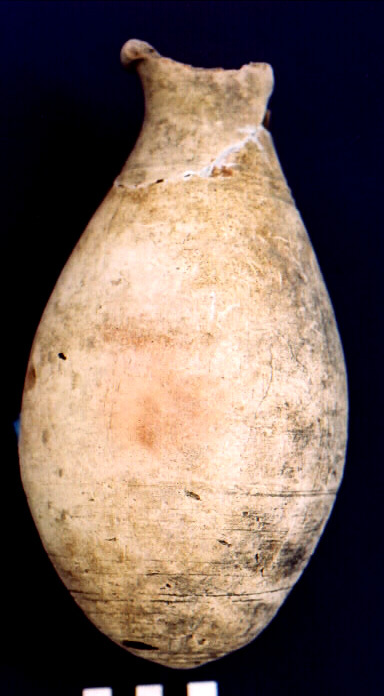 Eggshell Ware has been provisionally dated by the author to the later part of Tell Abu al-Kharaz Phase IV, i.e. the end of the Middle Bronze Age, with a lifespan which may extend into Late Bronze Age IA, in provisional absolute terms the second half of the 16th century (Fischer 1999: 11-13, 18, 24). The results of the first season of the renewed excavations at Tell el-‘Ajjul confirmed the high potential for future archaeological research within the fenced 5000 square metre area. It is therefore planned during the next season to extend the area of the excavation to the west of Trenches 1 and 2.